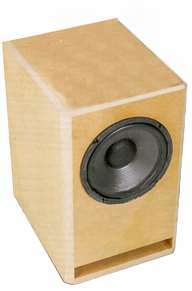 The CT 228 is a universal subwoofer that may e.g. be combined with the CT 225 satellites (see below). - the Monacor SPH 250 TC bass driver, with voice coils in parallel. If you wish to combine the CT 228 with CT 225's we recommend to relieve the satellites of the bass. Klang+Ton recommends to place a capacitor of 220 uF in the line to each satellite. The single capacitor (1) or the three capacitors in parallel (2) should be placed in the line to each CT 225 (e.g. the plus cable). 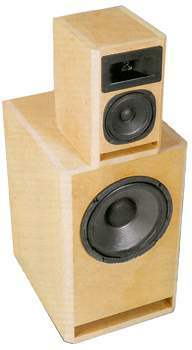 They could, certainly, also be placed inside each speaker between binding post and crossover using the plus cable.